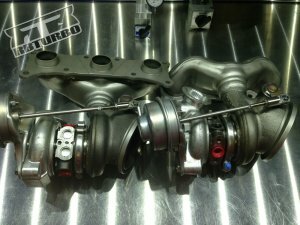 RB Turbo is one of few turbo builders who use the correct center-section (CHRA), for internal components, making the product much more reliable and expensive to produce. Our building process, in addition to using top flight wear-matched materials for the Billet INTERNAL wastegate modifications, equals a much better and durable design than OEM. Don't be fooled, if you find a lower price than RB Turbo, for something proclaimed to be the same, It’s safe to say that…it really isn't. Stealthy OEM appearance Stealthy OEM appearance that leaves people guessing about what's under the hood! Notes: This listing is mainly for people who don't have a set of spare turbos on hand. Rb will ship out the turbos to you. Once you have installed the turbos and ship back your OEM set of turbos back to them, the $600 core charge will be refunded.) During the check out process in the message area provided, please specify if year, transmission type and if you have a right hand drive or left hand drive vehicle.